As international Open Access Week celebrates openness of research across the globe, Jisc and the Coalition for Networked Information (CNI) add to the conversation with the launch of this year's report, 'international advances in open scholarship'. The theme of the week - open in action – puts into context some of the key findings of the report, and what they mean for higher education (HE) and researchers alike. 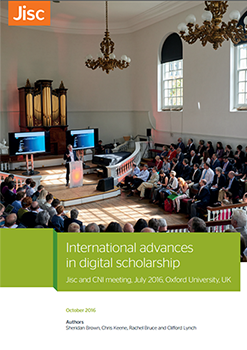 We hope the report will help to inform action for others, just as it will for Jisc and CNI. Action still needs to take place in terms of addressing the intentions of the policy agenda to maximise the benefits of open data, such as reproducibility, transparency and public engagement. And while openness is important it needs to be recognised that there are good reasons why data cannot be made fully open; to enable research data to reach its full potential, more nuance is required rather than a one-size-fits-all approach. Openness is more than just an ideal but as a means to increase research quality and efficiency. We have become accustomed to consider open access as representing a binary state: something is either open or closed at any given point in time. Jisc has produced guidance for HE organisations on how to implement open access policies for research outputs, and go beyond meeting the requirements of the Research Excellence Framework (REF) to make open access meaningful. We have also provided case studies in meeting funder requirements for making research data open. The community has come a long way and recent research has shown that citations have already increased by one fifth, with researchers opening the doors to their data; there are real benefits to taking action on open access. The conversation at the conference touched heavily on the need to find sustainable models for the infrastructure supporting open access and open data both in scholarly publishing and more widely across the research lifecycle. While the US and the UK have differing environments and approaches this is a question both need to tackle, the international nature of research lends itself to collaboration to help find solutions. In support of this, Jisc is developing innovative new services to enable the sharing of research data such as the research data shared service and research discovery service; and is working in partnership with the Open University on the aggregation of open access papers via its CORE (connecting repositories) service. Our conference report also points to some challenges for the international community in the transparency of data usage. Certainly the policy agenda in the UK, such as the Teaching Excellence Framework (TEF)1, adds to the interplay between practice, policy and technology. Learning analytics uses new technology to offer universities and further education colleges a means to improve support to students and evolve their learning experience to suit their needs. Just as researchers need to be involved in creating the metrics to analyse their outputs, the meeting with CNI called for students to help shape the tools to analyse their learning. Clearly neither learning nor research can be measured solely through metrics, and the algorithms and infrastructure underpinning both need to be open and transparent. As Mike Taylor reminds us, the open access agenda has come about from living in an internet-enabled world where copies of documents and data can be shared at no expense, and with no loss to the host. This sharing can be done an infinite number of times and give access to something of value, that was previously available to only one person, to a potential six billion people; this is the power of open access to research, but also the challenge for researchers and research institutes the world over; how, and to what extent, to embrace open data while alleviating fears of confidentiality, misuse, and lack of reward? These conversations will continue long after Open Access Week 2016 draws to a close, but the messages are clear, open data and access to this data are going to be key drivers in the world of research and learning. Further slides and resources from the event are available on the Jisc and CNI conference web page. I provide leadership of Jisc’s work on the future role and capabilities of digital scholarly communication, digital libraries, and digital scholarship for research and learning. Based in Jisc digital futures division, the focal point for innovation, research and development, I focus on medium and long-term trends and initiatives to help UK libraries and universities be at the forefront of digital innovation in learning, teaching and research. How can universities meet the expectations in the EPSRC research data policy?